And true, the kids will probably just try a bite or two, but who cares — they have the simple tomato-corn-red onion salad you made before mixing in the wheat berries and the feta. All you have to do is grill a piece of fish or pan-fry some chicken and you have the makings of the perfect summer dinner: fast, easy, fresh, and enough left over for tomorrow. When you can feel good about yourself all over again. Rinse 1 cup of barley under cold water. 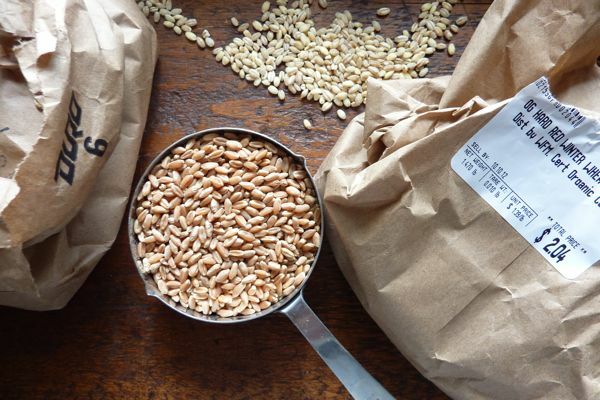 Bring 3 cups of water and 1 tablespoon of salt to a boil and add barley. Bring to a low boil (not quite as roiling as you would for potatoes), then cover and simmer for 50 minutes. Check after about 40. The grains should be slightly al dente because they’ll cook a little more when they sit in a bowl. Yields about 4 cups cooked barley. Combine 3 cups wheat berries, 4 1/2 cups water, and 2 teaspoons salt in a large saucepan over medium-high heat. Bring to a boil, lower the heat, and simmer, covered, until plump and chewy about 45 minutes to an hour. The berries should be slightly firm. Drain and set aside. Yields about 4 cups cooked wheat berries. Bring 2 cups water to a boil in a medium saucepan. Add 1 cup of quinoa and simmer, covered, until tender, fluffy, and water is absorbed — about 15 minutes. Let stand, covered, off the heat for 5 minutes, then fluff with a fork. Yields about 4 cups cooked quinoa. -Dried cherries, scallions, walnuts, mint, a little blue cheese, plus a mild vinaigrette. 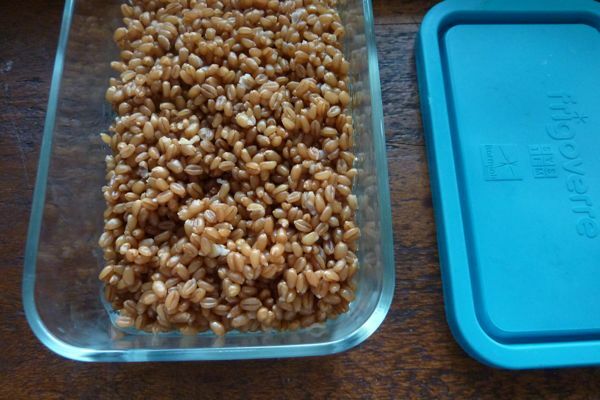 Who needs yoga when I can just look at my cooked, tupperware’d, stored, refrigerated wheat berries and feel at peace? I love wheat berries! They’re great with sweet things, too. My Lebanese grandmother makes a delicious breakfast of warm wheat berries tossed with sultanas and honey. So good. I just found your book at our library. It is absolutely charming. It’s the first cook book I’ve ever considered reading cover to cover. Congratulations. yeah yeah yeah! I did this on Sunday too! Wild rice and quinoa for me. I’m sitting here completely in awe of how stupid I have been — I do my steel cut oats this way for weekday b’fast, I cook up extra chicken, prep lettuce/veggies, etc. on Sundays. YET, I am constantly irritated making weeknight dinners because “we have to wait for the rice/barley/wheatberries to finish cooking”!!! You, Jenny, are a genius and my hero!!!! And the book is a MUST for all families – I don’t even see how families can properly function without it/this blog! I’ve never tried wheat berries, but now I want to. I am a fan of Farro and Bulgur Wheat right now for my bring-to-work salads and just mix in whatever leftovers we had from the night before. Oh, how I love this post. I, too, get so very excited by finally (finally!) following through on an idea that will help me reach a goal of some sort; eat more whole grains, use computer time more wisely, connect & engage with my kid, etc. Alas, I also struggle mightily with the insomnia/ruminating duo. (the illustration is genius) Was up for 3hrs. just last night. Or this morning. Or whatever. I just love that you wrote yourself a note, and I’m thrilled for your euphoria! And this recipe. Just last week I made two of your summer salads and loved them both. Thanks! I love wheat berries! I always have them on hand in my freezer and can’t wait to try this. I already make a few different wheat berry recipes from a friend’s food storage blog, but here is a link to my favorite: Fiesta Wheat and Bean Salad. Light, fresh, and delicious! And don’t forget big batch brown rice. This is a great idea! If I do this Sunday night, how long will this last in the fridge? ‘Til Wednesday? Friday? At what point will I open the lid and make that hrrm noise that means I’m getting dubious about the contents? Thanks for this post! I just bought barley even though I wasn’t sure how to cook it. I will be adding it to my salads. Can anyone tell me how long is this will be good in the fridge? I struggle between planning ahead and worrying food has gone bad! Ditto what Greer said — how long will these last in the fridge? I want to do this but will be so sad if I wind up tossing out food — heartbreaking! This sweet potato/pesto/quinoa creation has long been a favourite of mine… Can’t get enough of it! Hi, If you have the recipe for the pictured dish, I would really like to make that salad. 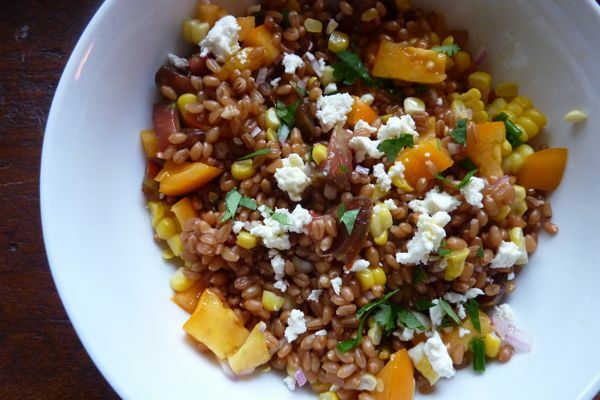 It is the one with what looks like butternut squash, feta, cilantro and corn in with the wheat berries. Thanks for all of the good ideas!